Since Hydromagic version 6.0, the software has built in support for motion sensors. Motion sensors can be used to correct your soundings for heave, pitch and roll. Hydromagic uses the motion sensor measurements to calculate, together with the beam width settings, the corrected depth and the transducer and GPS antenna displacements. To calculate the displacements a valid heading is required as well. In Hydromagic, motion sensors are configured using hardware plugins supplied with the software. Supported devices include Teledyne TSS, SBG Systems, IMU and compatible hardware. 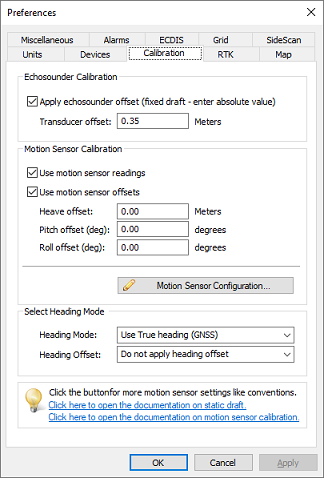 A motion sensor can be calibrated in the "Motion Calibration" section of the preferences window. To open this tab, select "Preferences..." from the options menu, and select the "Calibration" tab. Heave is used to correct the vertical motion of the vessel, caused by for instance, waves. It is important to disable heave compensation by a motion sensor when heave is corrected within the hydrographic echosounder. For this, select the "Echosounder outputs heave corrected depths" check box. The heave offset box will be disabled. 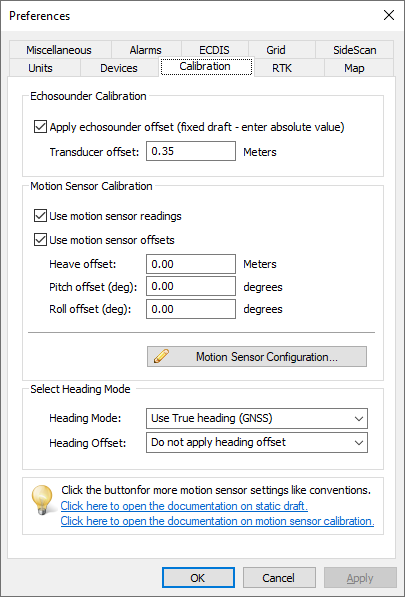 To use offsets for your motion sensor, enable the offsets by checking the "use motion sensor offsets" check box. Use the motion sensor offset fields to correct the roll (x), pitch (y) and heave (z) offsets outputted by a motion sensor. Enter the heave offset in the vertical units used by your project (usually meters), the pitch and roll offsets are always in degrees. When done, just click "OK" to apply the values. In the data view the heave, pitch and roll values should now contain valid values. When calculating the corrected depth and depth position when a motion sensor is used, the software needs to know the beam width(s) of the transducer. These values can be found in the documentation of your echosounder or transducer. When no motion sensor is used in the software, these values will be ignored.